Ozark Trail 12-Person 3-Room Instant Cabin Tent with Screen Room is a nicely designed freestanding summer camping tent with a 2-minute setup and a steel frame. Screen room + 2 rooms. The tent is currently available on Amazon-US at a really good price. On the Amazon-UK there is a blue version of this tent but the price is considerably higher. Ozark Trail is famous for its huge large family camping tents and they have many 12-person tents in particular, so it is easy to get lost. 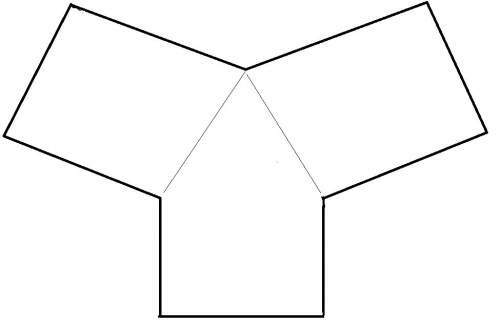 This tent presented here may look like a rectangular structure, but in fact, it is more a Y-shape structure as the picture below (very roughly) shows. I have seen people asking about this and this is why I made the sketch of its flor plan. This is the floor plan of the tent. This is also a 3-room structure and the rooms are depicted in the picture above. The tent is added to my list of best 3-room tents. Each of the rooms has its own door and several windows. This is a very typical cabin-style tent with very tall and straight walls, the peak height is 76 inches (193 cm). So as you realize, the ground shape is quite interesting and you can realize this also from the pictures below, without and with the two dividers. The view inside with closed panels and without dividers. This is with the dividers in place. The pictures above also show how you can completely close the windows and the doors, for privacy and for protection from elements. Note that you have 10 windows in total and they can be closed as you wish. One of its great features is the front screen room which you can see in the picture below. I have seen people asking about its features, so here to stress that this is a fully floored area just like the rest of the tent, there is no difference at all. The screen room is fully floored and protected. The screen walls which you have here are double-layer structures, so you have panels plus mesh and you have a full protection from elements and from insects. The picture shows you that the screen room’s door is the double size and an inverted T-shape. The other two doors on the other rooms are normal size but also very tall. So all in all, the screen room is a regular room, it just offers more features with its huge mesh on the three sizes. I have included it in my list of best tents with screen room. The setup procedure in a couple of minutes. Such a quick setup time is due to its poles that are a) telescopic, and b) pre-attached to the tent. So as you realize from the pictures above, you unfold the structure and then extend its telescopic leg poles. Due to such a nice design, this Ozark Trail 12-Person tent is added to my list of best instant camping tents. From this, you also realize that this is a fully freestanding tent. This holds even when you add the fly. 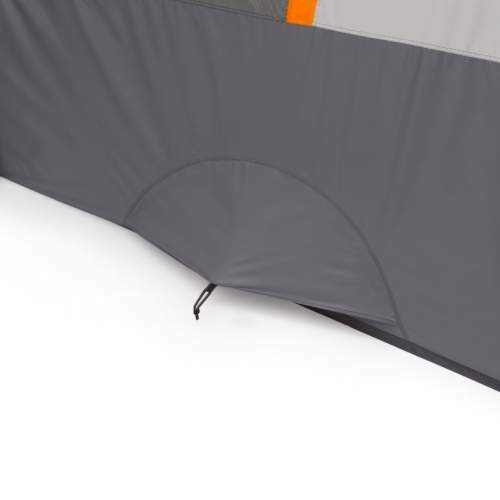 The picture below shows the tent without the fly so you can get some idea about its poles structure. 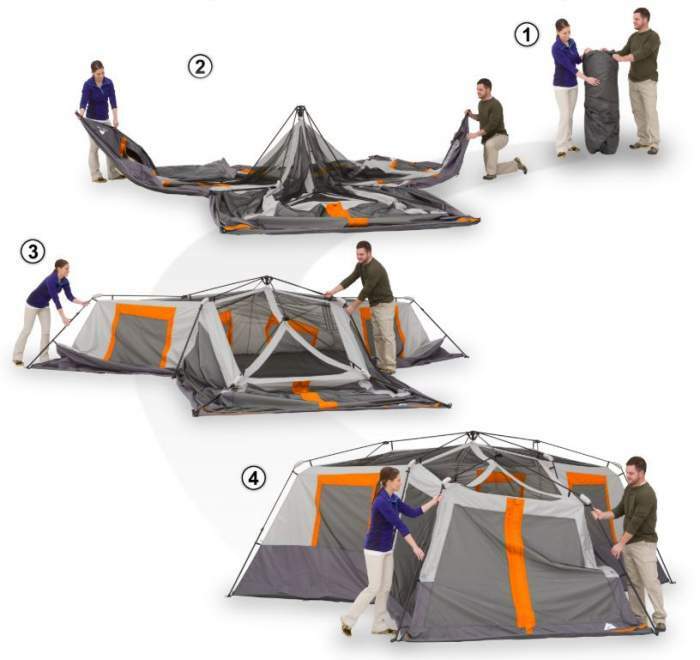 This is the tent shown without its minimal fly. The minimal fly you can add later and then clip it to the legs poles, and even after doing this, the tent can still be rotated and moved short distances. It comes with six guyline points so you can stake it to the ground when necessary. I would not miss to do so. The pictures below show how pleasant the inner area is, a huge space with windows everywhere, a real camp castle. View from one of the two inner rooms. View inside from the screen room door. Regarding the size, obviously this is a huge tent, but the declared capacity is no less than 12 people. Now, the tent’s dimensions are 20 x 18 ft (610 x 549 cm), but this is just the ground needed for the tent. You have seen above how the actual floor area looks, so the floor size here is (according to the manufacturer’s statement) around 56 ft² (5.2 m²) per room. So you have around 168 ft² (15.6 m²) total area and this means 14 ft² (1.3 m²) per person. This is far from enough, so the declared capacity makes no sense. 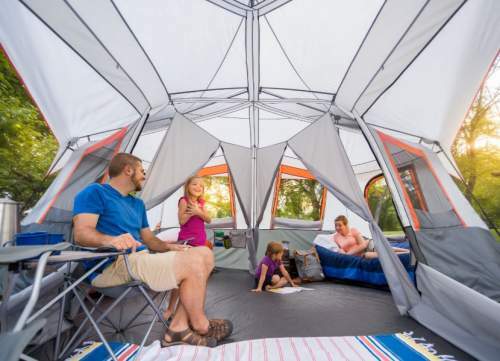 If used for family camping, this is a tent for parents with up to 4 kids. It is also perfect for two couples, the two separate rooms give some privacy and the screen room may be used as a living room. They claim that you can put three queen airbeds and this is true, but this would not be practical. You can put two in the back rooms and use the screen room for storage and sitting. Regarding seasons & climate, this is a summer camping tent for places without rain and strong winds. 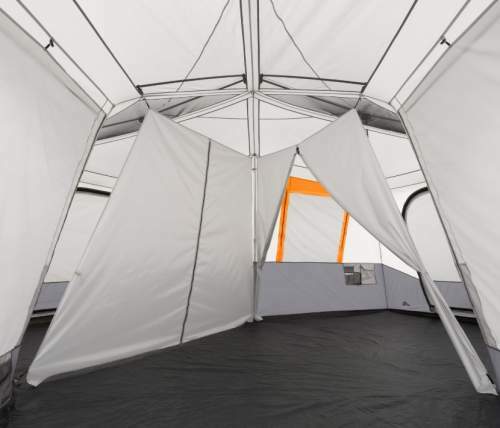 The waterproof rating is minimal, the fly covers only the ceiling, the tent is very tall and as such a huge obstacle for winds and it would not last long in a very windy place. 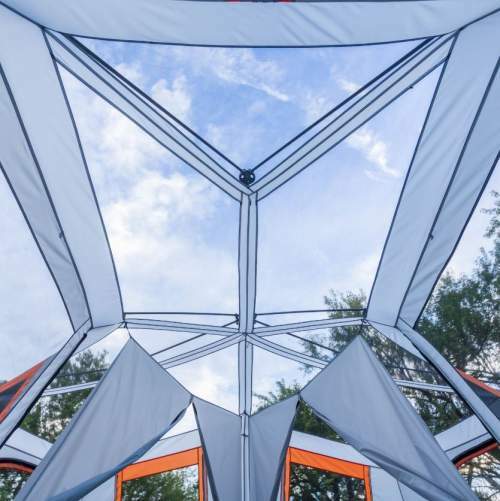 On the other hand, the ceiling is completely meshed (see the picture below), so you would not feel great in a cold environment, but it is perfect for a warm weather camping. Regarding the weight & packed size, with 45 lb (20.4 kg) this is a heavy tent, but see the area which it offers, and the packed size 50 x 12 x 12 inches (127 x 30 x 30 cm) is such that you need a car for transportation. Both the tent and the rain fly is polyester and waterproof rating on both is 600 mm. They do not provide any info about the floor material, but it looks different than the rest. The seams are fully taped. This is all steel construction, so the weight mentioned above should not be a surprise. I have seen their statement that all the poles are replaceable. You also have 17 steel stakes included in the package, so use them and stake the tent properly. The tent is with huge mesh windows around, plus all the ceiling is mesh (see the picture below), so ventilation is not an issue in this tent. But if it is raining you will have to keep panels on the doors and windows. So they have added vents and you have them 3, one per room. They are quite small but this should be enough. I have seen people asking if any of those vents can be used to fit an air conditioner, and the answer is no. There are six small gear pockets on the walls. Pity they did not add far more in such a huge space. 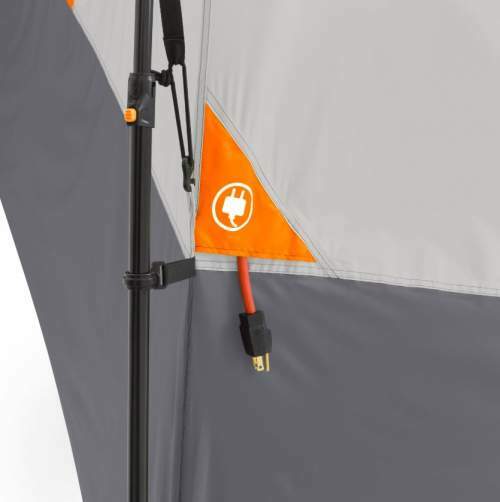 The tent comes with an E-cable port, see the picture below. The ceiling is all mesh. Not for heavy rains and strong winds. Weight: 45 lb (20.4 kg). Dimensions: 20 x 18 ft (240 x 216 in; 610 x 549 cm). Area: 168 ft² (15.6 m²). Packed size (carry bag size): 50 x 12 x 12 in (127 x 30 x 30 cm). Here you have this Ozark Trail 12 tent side by side with two other tents with the same declared capacity and built in a similar style. So all are cabin type tents with a minimal fly and freestanding. 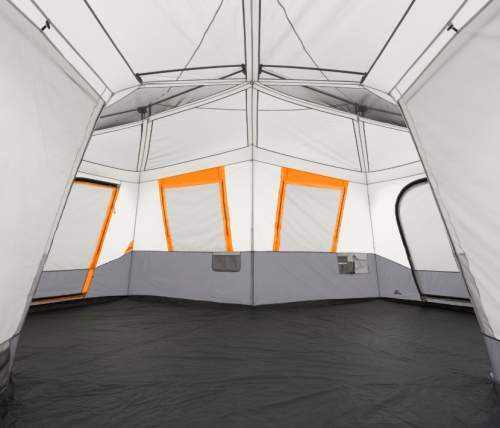 The Core Lighted Instant Cabin 12 tent is from a new series which come with an integrated light. The Eureka Copper Canyon 12 is the only here that is not with an instant design. As you see the Ozark Trail 12 looks good among them, please follow the links to compare the prices. 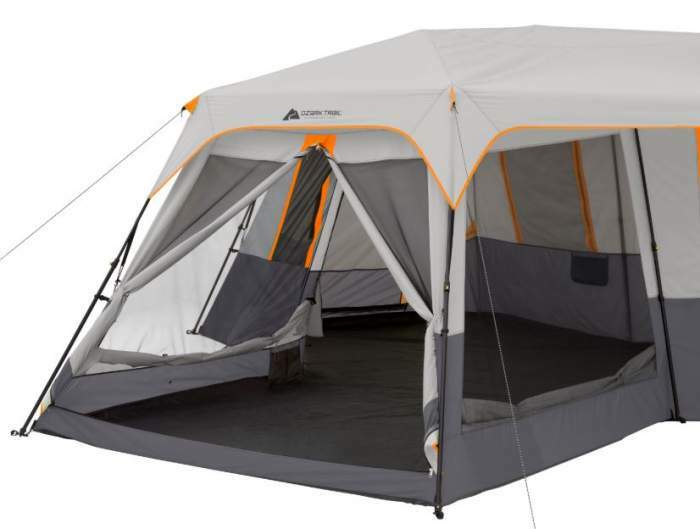 The name Ozark Trail 12-Person 3-Room Instant Cabin Tent with Screen Room is descriptive enough and it describes the best features of this tent. 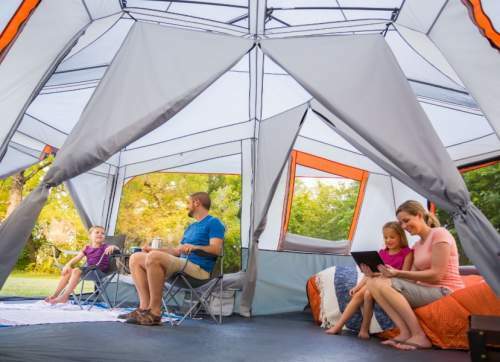 So this is a pleasant tent, designed for warm weather and summer camping. This is how it should be used and in this case you should have a great experience with this tent. If you need more options please check my list with the best 12-person tents, and also check in the category Cabin Tents.